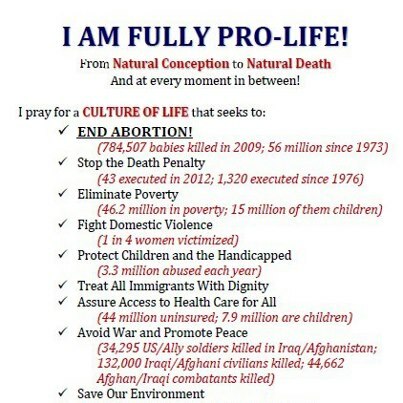 Pro-Life. What Does it Mean? 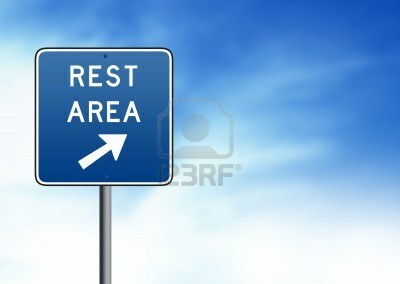 The Wandering Friar is rested and back to his blog. On Facebook I recently posted the statement that appears to the left. It came from a good friend and fellow friar, Fr. Tom Washburn, OFM. Interestingly it received no response, either positive or negative. I'm not sure of the reason why. I suspect though that many people looked at it and took exception to one or another item on the list. Liberals looked askance at some things and Conservatives at others. It is important for all of my readers to remember that politics is never the reason for the statement of my opinions. The Gospel is what guides me. I am a follower of Jesus before being conservative or liberal. That having been said we can ask, "What does it mean to be Pro-Life? ", an important question as so many are preparing for the march in Washington on the 40th anniversary of Roe vs. Wade. For me the answer is simple. As a Catholic and above all as a Franciscan it is clear that we are called to have a profound respect for the dignity of every human person. That's what unites the issues on the above list.In forty years we have not succeeded in overturning Roe vs. Wade. We need to ask why. It would be easy to blame those who are not pro-life and point to their stubbornness. But we need to ask also what we might do differently. I have some suggestions. First of all I think that we need to remember what an old Felician sister told me in Buffalo, NY many years ago, "You can't save an unborn child if you don't help the mother." Many, not all, abortions are the result of women feeling desperate and not seeing any way out. We have legislators who are against abortion but who won't vote to fund pre-natal care and counseling for women who cannot afford such services. Secondly we all need to admit that in different ways we are guilty of de-humanizing people as the basis for either killing them or dismissing them and justifying acts of injustice against them. Racism and religious prejudice happen because we somehow make the people who are different less than ourselves. By simply calling undocumented immigrants "illegals" we dehumanize them and block the road to any kind of just reform of our immigration policy. Thirdly, we need to stop hiding behind the belief that some issues are more evil or sinful than others. That is certainly true, but what all of the above listed issues and several others have in common is that they are all justified by dehumanizing the victims. People lament that calling an unborn child a fetus justifies aborting them but have no trouble calling the innocent victims of bombings "collateral damage." Finally, we need to take another look at the use of the phrase "innocent life". Yes, unborn children are innocent. Serial killers are not. But serial killers, though they have acted inhumanely, are still human beings. They belong off the streets because they are dangerous to the rest of us, but we should not take their lives. That is becoming more clearly the teaching of the Church. Not all cafeteria Catholics are liberals. Perhaps if we focus on allowing ourselves to be called to a deeper conversion on the issue of the dignity of every human person and every living thing as well and not just on what we are against, there will be change in all of the above areas. Just thought that I'd let my blog followers know that having sent my book's final editing off to the publisher to await printing and feeling a need to shut down my pen for a while I'm taking a brief respite from this blog and will post again in a few weeks, probably after finishing my annual retreat on January 24. Holy Mary, Mother of God--Happy New Year--Shalom! Peace! Happy New Year 2013 to everyone! 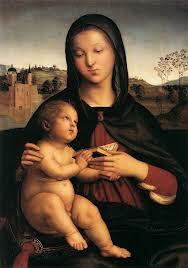 In the Church today is celebrated as the Feast of Mary, the Mother of God and also as a World Day of Prayer for Peace. Many of us grew up when the day was named the Feast of the Circumcision. What are we celebrating anyway on this day? Early on it was celebrated as the naming and circumcision of Jesus and this tradition still holds in some churches, notably among Lutherans. It is the last day of the octave of Christmas as well. There are then several layers of meaning for the feast. So what's behind these various names? What do they all in the end have in common? In the year 1993 while on a study sabbatical I toured Israel and Turkey with a Scripture Study group and had the privilege of celebrating Mass at the ruins of the ancient Basilica of Holy Mary in Ephesus where Mary was declared Mother of God at an ecumenical council held there in 431. There was a heated debate among the bishops, some of whom wanted follow Nestorius who separated the human and divine natures of Jesus and thus saw Mary only as the mother of the human nature of the Lord. This view was not upheld and Mary was declared to be the "Theotokos", Greek for God Bearer or Mother of God. The doctrine is really more about Jesus than about Mary. It is saying that the mystery of the Incarnation means that the divinity and humanity of Jesus can never be separated and thus in bearing her child Mary was bearing Jesus who is true God and true man. Even today I think that many Christians think more like Nestorius. They allow the divinity of Jesus to trump his humanity, thinking that He must have been a little more divine than human. This is understandable even if it is regrettable because it really is amazing to think that God became human given some of the awful things that we humans do. This same affirmation of the humanity of Jesus is one of the reasons why the circumcision was celebrated. In acknowledging this observance of Jewish law there is an affirmation of his sexuality. What could be more truly human than that? The circumcision was also seen as the first shedding of His blood and therefore the beginning of our redemption. And for us today what does all of this mean? After the recent horrors that happened in Newtown, CT, with the terrible civil war raging in Syria, with all of the violence and lack of respect for life that we see around us, our belief that God finds humanity so special that God chose to become one of us in Christ and continues to desire to dwell among us in so many ways ought to awaken us to a deeper respect for each other and for the world in which we live. The mystery of the Incarnation that we celebrate throughout this Christmas season should tell us that if the Son of God entered into our history as one of us and breathed the air that we breath and walked on the soil of this planet then we are gifted with a great dignity, a dignity which we should then share with one another as well as on the earth which we inhabit. More that any laws that we might pass (and there are some that I think should be passed) our embracing of this great mystery of love, of God in human form, will heal our angry and often violent hearts and bring to the world the Peace that only He can give. Happy New Year everyone! Peace on Earth!